The cups and balls is a classic of magic, but not one that can be performed well. This is because of the effect contains many different occurrences of magic. Little balls appear and disappear under the cups, they penetrate the cups and also get transported from one cup to another cup. Finally, they transform into other objects. The entire effect can be quite confusing and difficult to follow by the audience. The great Dai Vernon has solved this problem by breaking the entire routine into phases – each phase has a different theme, and there is a transition from one phase into another. This makes the entire act easy for the audience to follow, and for them to better appreciate the climax ending. The cups and balls routine by Jamy Ian Swiss is a variation of the Dai Vernon routine, but it also includes some ideas and moves by other magic greats. The routine has evolved to become the Jamy’s personalised routine of cups and balls because it incorporates a lot of Jamy’s own ideas and presentations. Jamy starts the performance by telling a little about the history of cups and balls. He then introduces each item of his props. This includes a 2-piece wand which he screws together in front of the audience to form the complete wand. 3 cups are then introduced and only 1 ball. The wand penetrates the cups, and the cups themselves penetrate each other. Magically, 2 more balls make their appearance. From here, the basic routine of cups and balls is performed. A spectator is invited to participate in the middle of the act. She uses the magician’s wand and causes magic to happen by herself. The introduction of the spectator brings variety and interaction to the routine. Finally, a ball and 3 fruits make their appearance under the cups. When the audience think the effect is over, the performer produces a shot glass with a drink from underneath one of the cups as a befitting climax to the entire act. 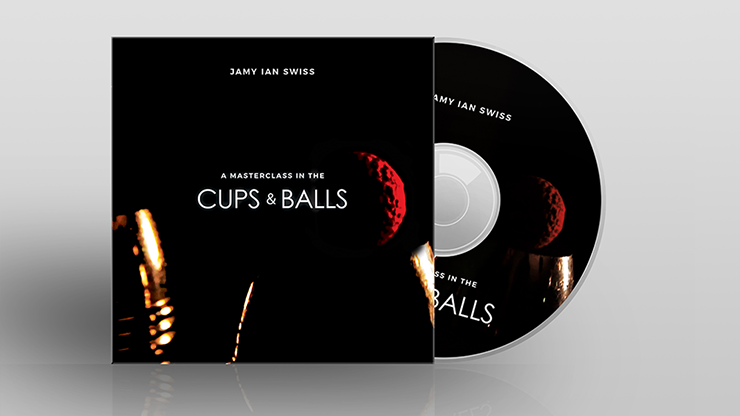 You receive a well produced DVD with Jamy Ian Swiss performing and then explaining his full cups and balls routine. The DVD runs for a little over 1 hour and contains a menu that makes it easy to navigate around the contents. Jamy explains the various false transfers of the balls, his method of loading objects under the cups, and his special apparent wand spin vanish of not 1, but 3 balls. He also shares his own design of a holder for liquid load. The best take-aways from the DVD are the valuable insights you gain on how to construct an effective magic routiine as Jamy explains the why and how he puts together the various phases of his cups and balls act.